We're delighted to present our specially-designed gift baskets! We are so proud of the wonderful products made for us by local Rhode Island artisans and independent businesses, we can't wait to share them!! 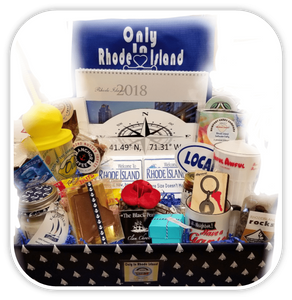 Only In Rhode Island is pleased to offer pre-designed and custom-made gift baskets, each with a fantastic selection of Rhode Island favorites. Gift baskets for holidays, birthdays, business, weddings, conventions, hospitality, or any occasion you can think of. Whether you prefer a simple gesture or something with a lot more impact, we have just what you're looking for. With the most unique products in the Ocean State, Only In Rhode Island is the ideal source for all your gift-giving needs. Our innovative selection offers a range of options that are perfect for family, friends, employees, business associates, or anyone to whom you'd like to show your appreciation, affection, or admiration. We can create the perfect gift or gift basket for corporate VIPs, wedding party favors, centerpieces, hospitality appreciation, birthdays, anniversaries, or any other occasion you wish to make truly special. Here we present our most popular pre-designed gift bags and baskets. Of course, you can also choose your own assortment of products from our website and we'd be happy to put them all together for your perfect gift! Just let us know in the comments section of our checkout page and you're all set! Our pre-designed gift selections are packaged in our own custom recyclable tote bags, in Rhode Island Blue. You can also choose the traditional basket for just $3.00 more. Our customers have expressed an overwhelming preference for the eco-friendly re-usable gift tote, so we're offering it at no extra charge! Whether you need one gift or 1,000, you can trust Only In Rhode Island to represent your thoughtfulness with the best possible taste and highest quality standards. For multiple-recipient orders, you can just fax or e-mail the shipping info and we'll do the rest. We'll take care of everything and you can take all the credit!